Sheffield, Britain's fifth largest city saw its own GP Polyclinic or Super Surgery open earlier in the year that aimed to fill the gap in delivering competent GP healthcare services, 7 days a week from 8am to 8pm, which after initial teething problems it is hoped that the Super Surgery will deliver quality and timely healthcare to many of the people of Sheffield that remain deprived of good quality healthcare. The new Polyclinic is situated in the centre of Sheffield on the corner of Rockingham Street and Broad Lane, which allows any member of the public to walk in and see a doctor without the need to be registered with the health centre that offer a wide range of healthcare services. This is an important development as the traditional surgery staff have a procedural tendency to lose patients of their lists with the result that a patient attempting to make an appointment is told that they cannot do so because they are no longer registered with the surgery and have to complete a form and wait for a week or longer to be registered with the surgery. Off course, the GP surgery profits from the process of re-registering patients that the surgery themselves have removed so perhaps an Department of Health investigation is in order as to how widespread this practice is of generating extra revenues for surgeries from existing patients being forced to re-register. 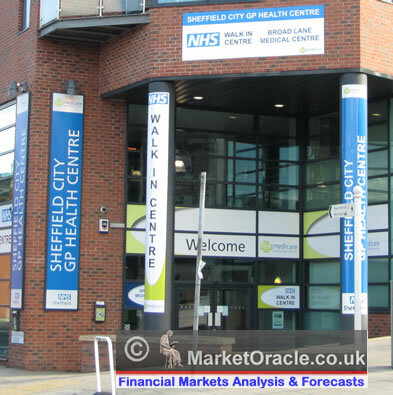 Sheffield, as is the case with most large cities has suffered from a wide disparity in the quality of GP health services which is mainly split along the lines of the affluent wards and deprived wards which has come to be more widely known as the postcode lottery. 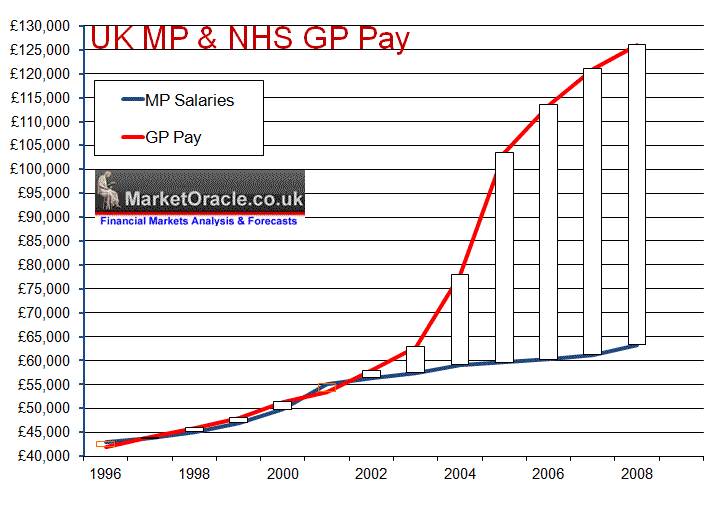 However this lack of quality of healthcare was worsened by the 2003 GP Pay Contracts as the new contracts that came into force for the year 2003-04 saw GP Pay soar during the following 3 years by as much as 35% per annum. If GP Pay had grown in line with average earnings then the current average GP salary should be £68,000 against the actual average of over £125,000. The consequence of the surge in pay has resulted in a sharp drop off in the amount and quality of GP hours worked to especially those living within deprived areas of the country. The reason why this amounts to a betrayal of patients is due to the fact that GP's fought tooth and nail during much of 2008 against the governments plans to implement Super Surgeries that would aim to provide 7 days a week, 8am to 8pm GP walk in services for patients. This brought the threat of real competition to what amounts to an old boys network operated by GP's that has seen GP Pay soar by as much as 35% per annum whilst cutting hours worked. If GP Pay had grown in line with average earnings then the current average GP salary should be £68,000 against the actual average of over £125,000. Since the birth of the NHS in 1948 your local GP was contracted to come and see you out of hours, but following the Labour governments incompetent GP contracts that they were perhaps hoodwinked into signing upto, GP's in effect pulled a trick on the government by means of on the one hand giving up £6,000 in pay for opting out of our of hours services whilst on the other hand being handed a £60,000 pay hike on top of which they would have earned if pay had risen in line with average earnings. Which has resulted in the debacle of NHS trusts being forced to fly in doctors from mainland Europe that has resulted in unnecessary deaths and cost. The Labour government's recent ANY GP choice announcement is to be implemented during 2010 (after the next general election). On face value this smells of pure electioneering i.e. 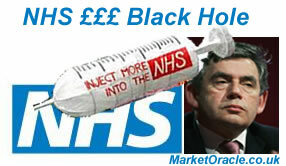 so as to buy votes from people fed up with an NHS that could not care less of the patients that it purports to serve. Typical experiences (especially in deprived wards) are disinterested GP's that treat patients as ATM cards to swipe in and out of surgeries so as to maximise surgery earnings, where it can take as many more than 5 visits before a patient receives a competent diagnoses, and then has to go through the Hospitals waiting lists where appointments can be arbitrarily cancelled without noticed and the patients made to wait several more months the consequences of which are thousands of unnecessary deaths and minor illnesses which result in permanent loss of quality of life for thousands more annually. The new initiative will at least start to deal with the estimated 30% or so of incompetent GP doctors that will face real competition and therefore need to either start doing the job they are paid to do or lose ALL of their patients to more competently run GP surgeries. It will also enable private healthcare providers to introduce surgeries in more relevant locations for patients such as near the patients workplace or even within shopping centres or super markets. The government having so far only paid lip service to market orientated reforms and that mostly on the supply side rather than demand side. True market reforms have never been an real option as that would in effect put the power in the patients hands rather than the doctors / consultants. The NHS needs to resemble the private market place where the GP or hospital have to compete to attract patients through a record of delivering good competent healthcare. The medical profession in response to such suggestions state that the patient is incapable of making the decision of choosing who is best to treat them. Instead today patients with serious illnesses have to do far, far more than consult a few league tables and GP / hospital reviews to get competent healthcare, routinely patients have to fight tooth and nail to get effective medical treatment that is denied to all but those with the loudest voices and persistence despite their serious illnesses. It is my opinion that it is the objective of the Labour party to implement a policy of enabling real choice of GP practice for patients, however as the Poly Clinics have demonstrated it is something that if it begins to materialise will be met by much resistance from the GP establishment that are expected to embark up on an even more alarmist campaign of scare mongering than that witnessed during 2008. However the GP doctors also understand that it is highly unlikely that Labour will win the next general election and therefore there is little to be gained by forcefully objecting to the policy ahead of the next General Election. www.tomsanguish.com details case No. 6 Patients Association Report - Thomas Milner. The Sheffield Teaching NHS Hospital Trust says 'If we get something wrong, we will do our best to make amends'. I don't think the NHS is rubbish - waiting to be seen is a pain.. I have been a waiting person, but I have also seen how wonderfully well my mother in law has been treated in readiness for open heart surgery, and is still dithering about whether or not to have it done - if she does not she has wasted hours and hours of test times and consultants technicians and nurses valuable time, yet the continue to treat her with great care and consideration , whilst I want to slap her!! I see how well my son has been treated since being diagnosed with diabetes , how they looked after my mother when she suffered a fatal heart attack and struggled to save her, how they cared for my grandson when he had suspected meningitis. I have had a few bad experiences - but in my experience the good far far outweighs the bad.